Providing you the best range of strain amplifier, strain gauge amplifier, strain gauge and strain gage amplifiers with effective & timely delivery. Dynamic strain measurement is applied for quickly changing phenomena, and thus different from static strain measurement, the measured results cannot be read on an indicator. Usually, therefore, a strain amplifier or signal conditioner amplifies the gage bridge output and digitizes the amplified signal to record and analyze the data using the PC or Monad Digitizer, while in the past an analog tape or chart recorder recorded the amplified bridge output. Dynamic strain measurement requires faithful response, stability, good SN ratio and high resistance against external noise. Monad’s dynamic strain measuring instruments satisfy these requirements by adopting advanced technologies including high-performance ICs, high-density circuits, CST (capacitance self-tracking) and under environmental tests. In addition, recently measurement has become complicated and diversified, requiring dynamic strain measuring instruments to have versatile functions. 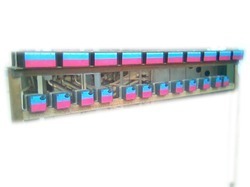 To cope with this need, Monad has developed the series, which can freely incorporate multiple and different conditioner cards, including not only strain amplifier and signal conditioner cards but also thermocouple, F-V converter and charge amplifier cards. The strain amplifier card can connect to a strain gage or strain gage transducer (load cell, pressure, displacement, acceleration or torque transducer). The F-V converter card enables measurement of the pulse frequency of a rotary sensor, while the charge amplifier card can connect to a piezoelectric accelerometer of any type. Depending on the bridge excitation mode, dynamic strain measuring instruments are classified into two types: AC and DC. Monad calls the AC type a strain amplifier and the DC type a signal conditioner. AC type strain amplifiers are suitable for measuring small strain and DC type signal conditioners, for measuring large strain with strain gage transducers. DC type signal conditioners are further classified into constant-voltage and constant-current systems. The constant-current system is suitable for measurement with the cable extended. Looking for Strain Gauge Amplifier ?